Sweet potato vines are the classic "spiller" plant for container gardens. They are easy to grow, beautiful, and their long tendrils spill wonderfully over the edges of containers and down the sides. They are available in a wide array of colors from almost black to chartreuse, and there are several different leaf shapes to choose from. Are Sweet Potato Vines Edible? Sweet potato vines are in the same family as edible sweet potatoes (Ipomoea batatas). They are bred for the beauty of their leaves rather than the growth of tubers. The vines from this plant make it look more like a morning glory or clematis than a member of the potato family. 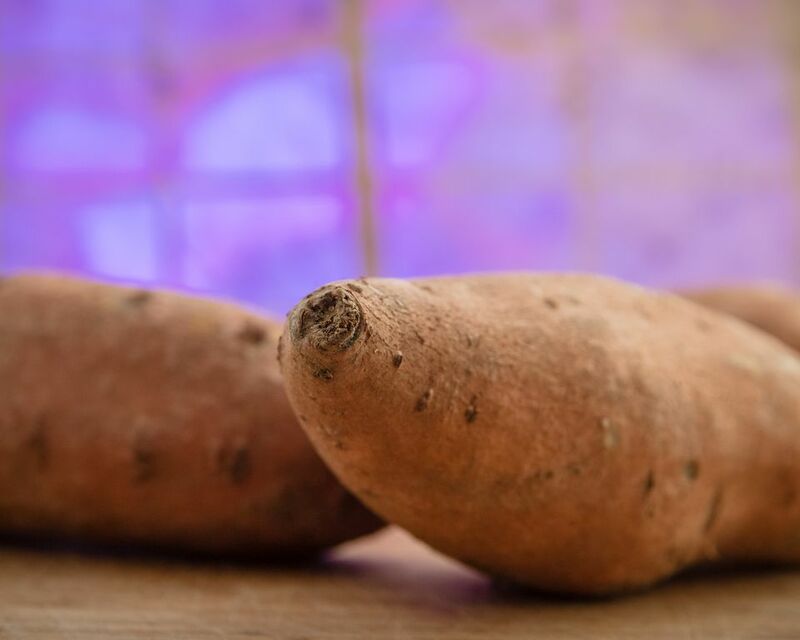 While the leaves of the edible sweet potato are delicious and a delicacy—especially when they are young and tender—eating the leaves of this ornamental vine variety is not recommended. While they likely will not kill you, the ornamental vine leaves are not meant to be eaten. The taste of the leaves and tubers resulting from this variety tend to be bitter or bland. Sweet potato vines love the sun and do best in full heat. This plant is grown primarily for its wonderful foliage and tropical feel. Although sun lovers, you can plant ornamental sweet potato vines in full sun to partial shade. They thrive in well-drained soil and need to be fertilized regularly during the growing season. Keep an eye on these sneaky plants, though. Sweet potato vines can get unruly. Sometimes they even attempt a takeover and try to dominate the container, in which case they need to be pruned. Sweet potato vines are easy to grow from existing plants. Simply break off a branch. Make sure there are several leaf nodes. Remove all the leaves on the bottom few inches and submerge the stem in water. In a few days, you should see roots. This is a good way to overwinter sweet potato vines because they will last all winter in the water and be ready to plant in the spring. It is also easy to grow your own sweet potato vine from an edible sweet potato. While it won't be as stylish as the ornamentals, they are still not bad to look at. In fact, before ornamental sweet potato vines became all the rage, edible sweet potato vines were popular house plants. The other great thing about growing edible sweet potato vines is that you can eat the leaves and grow actual sweet potatoes from the sprouts, which are termed "slips." Sweet potato vines can become victims of the golden tortoise beetle. This beetle looks like a teardrop of molten gold has landed on your sweet potato vine. While interesting to look at, the beetle will munch holes in your leaves, making them look like Swiss cheese in a very short amount of time. Depending on where you live, there are a couple other pests that feast on sweet potato vines. The sweet potato looper is a caterpillar that chews on the leaves. The sweet potato whitefly can drain the plant of nutrients and stunt its growth. In some areas, sweet potato weevils may pose problems as well. Think potatoes are tough to grow? Think again! How do I grow vegetables in small spaces?